Behind the great achievements of Cuban athletes in the past fifty years is the presence of extraordinary coaches who with their dedication and wisdom have managed to discover, develop and get the best out of the talent of their trainees. I shall talk about some of them who have made a stellar contribution to the history of Cuban and world sports. Eugenio George rightly deserves to head the list: he was a brilliant guide for 40 years (1968-2008) on the incredible women’s volleyball team nicknamed the Morenas del Caribe. Eugenio George is a veritable legend. The perfect term to define his relationship with the players is “rapport.” Some of the women confess how he was always in tune with their moods and nothing would ever escape his notice, no matter how insignificant. He was like a special father figure. He also looked after how the girls behaved and talked, even their manners at the table. But especially, like nobody else, he had a very clear idea about the value of training. He knew that most games were won in this pre-game process. As a player, George represented Cuba at the Pan-American Games in Mexico in 1955 and in Chicago in 1959, with his farewell from active sports taking place in the Central American Games in Jamaica in 1962. The International Volleyball Federation (FIVB) named him the Best Women’s Volleyball Team Coach of the Twentieth Century. He was also president of the Cuban Volleyball Federation, later continuing to work as a consultant to national teams. In 2005, he was inducted into the Volleyball Hall of Fame for his proven track record as coach and teacher to generations of volleyball players. He was also the deserving recipient of two decorations, the National Hero of Labor and the FIVB Golden Collar Order awarded to him by the NORCECA Confederation, of which he was president of the technical and coaching committee, until his death. As coach, his team won three Olympic Gold Medals (Barcelona 1992, Atlanta 1996 and Sydney 2000), along with an equal number of first places at the World Championships of 1978, 1994 and 1998 just to mention a few of the most important ones. When he died on May 31, 2014, he left many admirers who remembered seeing him sitting on the sidelines stoically dealing with the excitement of the games, noticing small details and providing the necessary calm for the players. Another essential figure in coaching is Alcides Sagarra, born in Santiago de Cuba in 1936. After a boxing career in which he won 87 of his 97 fights, in 1964 he became the trainer for the Cuban national team. A short while later he was promoted to head coach. It is a sure fact that with him in place and with the advice of foreign coaches, the great boom in Cuban boxing was born, taking the sport to phenomenal heights. His work is backed up by having trained 46 world youth champs, over 30 Olympic champions and 48 world champs. Even more: he founded and developed a phenomenon that is highly respected all over the world: the Cuban School of Boxing, which is outstanding for its technical excellence and for the distinct mobility of boxers in the ring. Fans of Cuban boxing will always remember Sagarra for his unique explosive character in the corner, always demanding more. The key to his success was to ensure the fabulous physical conditioning of his athletes and the way they kept up their impressive fighting spirit. When the name of José Godoy is mentioned, there may be many who do not know who he is, but when we say he was the coach in charge of training the high jump world record holder Javier Sotomayor, we immediately feel a great deal of respect. Born in 1926, Godoy started coaching in the 1950s and with the triumph of the Revolution he travelled to the then USSR for professional training. On 1982 he took on the task of preparing Sotomayor and it was under his guidance that this athlete became truly amazing, breaking one record after another until he reached youth world records and then the adult world record levels. His chief principle was that first you had to train the man and then the athlete. 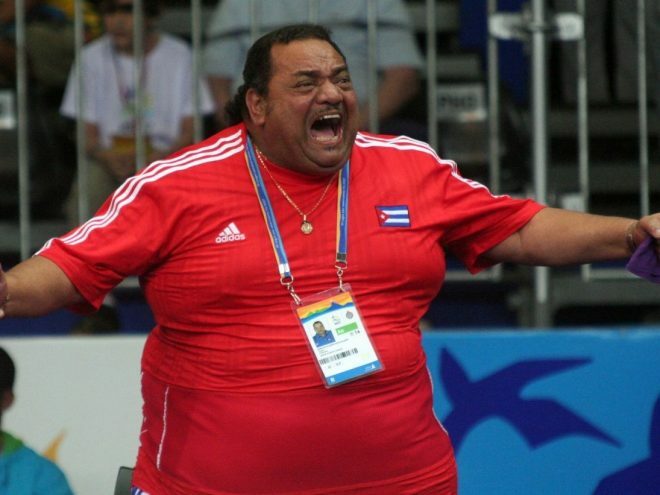 And to round up this brief list of outstanding Cuban coaches, we will talk about Ronaldo Veitía, one of the most charismatic and beloved figures in sports in Cuba, affectionately called “el gordo Veitía.” From 1986, this black belt and eighth dan was the head coach of Cuba’s women’s judo team until 2016, the year he retired. It only took a few years for his magnificent work to show great results. Under his supervision, during the 1990s and into the 21st century, the Cuban women’s team has been racking up world and Olympic titles. His team has also won consecutive gold medals at the Pan-American games from the year 1975. He took part in six Olympics from 1992 to 2012, obtaining 5 Golds, 9 Silvers and 10 Bronzes. Such results made him the coach with the greatest number of Olympic medals in the history of judo. During his 30 years as coach, he obtained 308 international medals for judo. At the competitions he looked like he was fighting alongside his girls. He was very excitable and would cheer on his athletes by shouting his instructions. Whenever they would win, he would pick them up as part of a grand celebration. Veitia was passionate about his profession and felt great pride that he was part (“essential,” I should add) of the process that has made Cuban judo a world power.